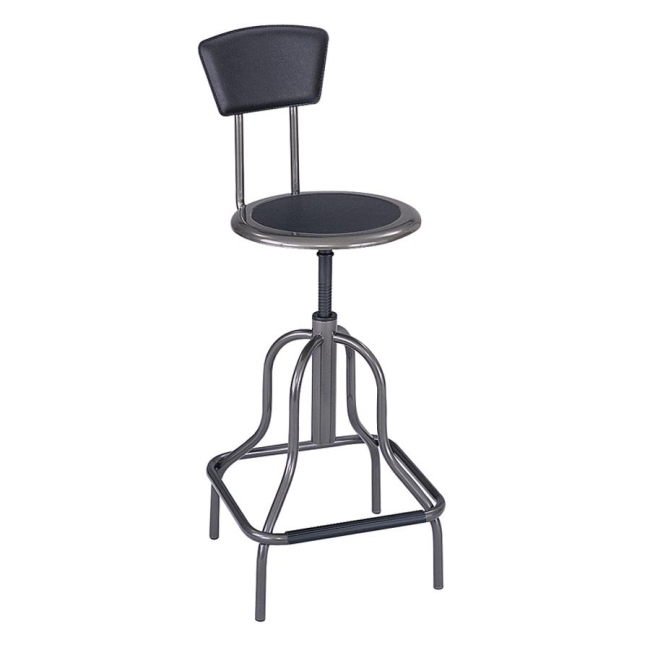 Industrial stool is ideally suited for workbench and work table use in the industrial, institutional and educational industries. Nylon-coated screw lift manually adjusts height. Stool holds 250 lb. Leather padded steel seat has a 14" diameter Leather padded back measures 12" wide x 7" high. High base measures 21" wide overall. Seat-to-floor measurement is 22" to 27". Functions include manual seat-height adjustment and 360-degree swivel. Stool is made with a rugged steel frame and clear coat pewter finish. 16" base has durable nonmarring rubber feet to protect floors.